Tens of thousands have gathered on Friday in Cairo's Tahrir Square under the two titles “Solidarity with the Palestinian Intifada” and “National Unity”, waving both Egyptian and Palestinian flags and carrying banners that emphasise national unity. Several demonstrators also burned Israeli flags while waving Palestine's to revive the memory of the 15 May Nakba Day when Palestinians were forcibly evicted from their land and homes, establishing the state of Israel. Earlier, thousands attended early morning prayers to mark the Palestinian Nakba. The Friday sermon delivered in Amr Ibn El-Aas mosque to thousands of worshippers by Sheikh Mohamed Gebril focused on the unity of Arab nations and their solidarity with Palestinians. 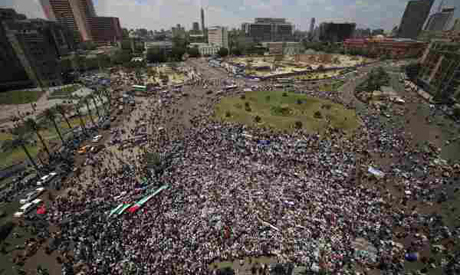 In Tahrir Square itself, thousands of families attended prayers. A series of events reviving the memory of Nakba Day are planned starting Friday and until 15 May. On Saturday, a convoy will leave from Tahrir for the Rafah border crossing with Gaza where demonstrators will call for the right of Palestinians to return to their homeland. Within the occupied territories, the anniversary of the Nakba is expected to witness a third Palestinian Intifada calling for the right of refugees to return home. Meanwhile, the sit-in outside the state TV building in Maspero is still going strong for the fifth day. Protesters congregated in response to Saturday's Imbaba church attacks to demand equal rights for Egypt's Copts and display solidarity with those targeted. The violence against Copts left 12 dead and more than 240 injured. Egypt’s interim prime minister, Essam Sharaf, promised on Wednesday that discriminatory laws against church building in Egypt will be revoked within 30 days. The current law, from 1934, will be replaced by a unified code for mosques and churches. Where is the support for Syrians? It's very sad that there is no Egyptian solidarity for their brothers in Syria who are being massacred for protesting for their rights & freedom just as Egyptians did.